In a large pan, fry turkey breakfast sausage until well done. While sausage is frying beat the eggs together in bowl. Prepare tortillas by putting ¼ cup cheese down center of each tortilla. Heat each in the microwave right before serving to soften the tortilla and melt the cheese. Add beaten eggs to sausage and scramble them together until cooked to your liking. Add egg/sausage mixture to heated tortilla. 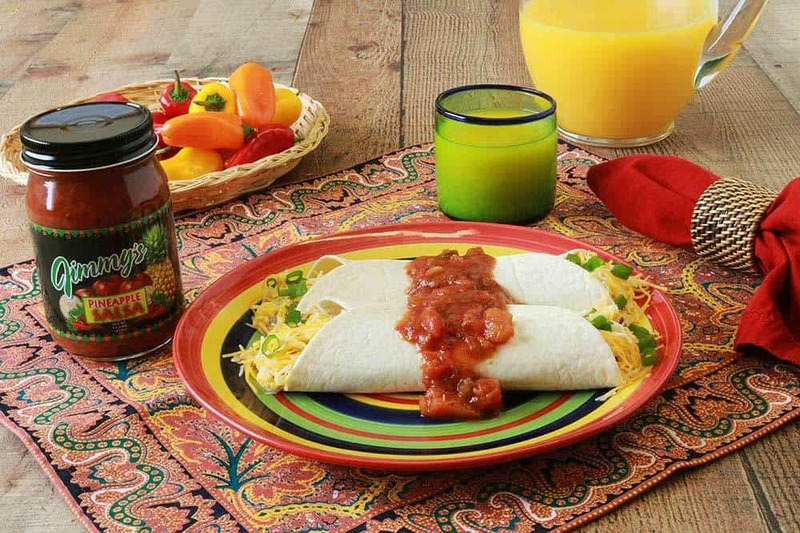 Before folding it, add Jimmy’s Pineapple Salsa and Jimmy's Taco Dip, wrap it up and serve.